Waterproofing Services North Little Rock - The Importance of Basement Waterproofing | American Structure Inc.
It’s likely that your basement doesn’t get the love that it deserves. More often than not, the basement ends up becoming a place for you to store holiday decorations during the offseason, boxes containing various ins-and-outs that you’ve slowly accrued over the years, and who knows what else. However, your basement plays a vital role in the overall condition of your home. While we’re not saying that you have to clear out all of the boxes and sweep up, but do you know if your basement is waterproofed? In the general excitement of buying a house, whether or not the basement is waterproofed doesn’t often come up. But for the safety of your family, and the condition of your house and its foundation, waterproofing is a must. Especially if you own an older home, it’s possible that your basement is not waterproof, or the sealants used are now out of date. If you’ve noticed leaks or puddles in your basement you’re going to want to give American Structure Inc. a call as soon as possible. Along with our other construction services such as foundation repair and drainage services in North Little Rock, we also provide comprehensive waterproofing services that go beyond just water remediation or leakage. 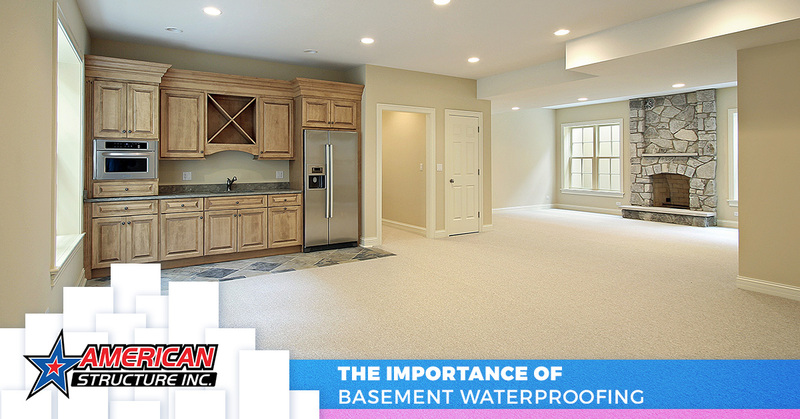 Learn more about the importance of basement waterproofing in this blog, and if you’ve recently moved into a new home or have noticed water getting in, contact us today! Over time, your home’s foundation begins to shift and settle due to the moisture in the soil around your property. While some movement is to be expected, the strain sometimes becomes too much for the foundation. Cracks and other foundation damage will begin to appear, and if your basement hasn’t been waterproofed, this can lead to flooding, pest infestation, and more. Even if you don’t have a collection of aforementioned boxes and trinkets in your basement, it’s likely that you do have some belongings down there. Without having the basement properly waterproofed, anything that you have in the area is at risk of being damaged. Not to mention the cost of foundation repair. A waterproofed basement immediately adds property value. So, if you ever plan to sell your home, you can rest assured that you’ll get the most out of it. Forget about your belongings, the most important thing to keep safe in your home is yourself and your loved ones. If your basement isn’t waterproofed, this can lead to hazardous foundation damage. Not to mention, if water seeps in your home is at risk for mold and other health concerns. If you know that your basement isn’t waterproofed, or you’re unsure, play it safe and contact the construction specialists at American Structure Inc. Family owned and operated, we’ll ensure that your home is in its best condition so that you can rest assured that you won’t be facing any costly repair damage, and know that your home and your loved ones are safe. Don’t hesitate to contact us today for a free estimate!